Wolf Hollow Assistant Director Zee Soffron interacts with a wolf. Editor's note: please call Wolf Hollow for weekend hours at 978-356-0216 before traveling there to ensure tour availability. 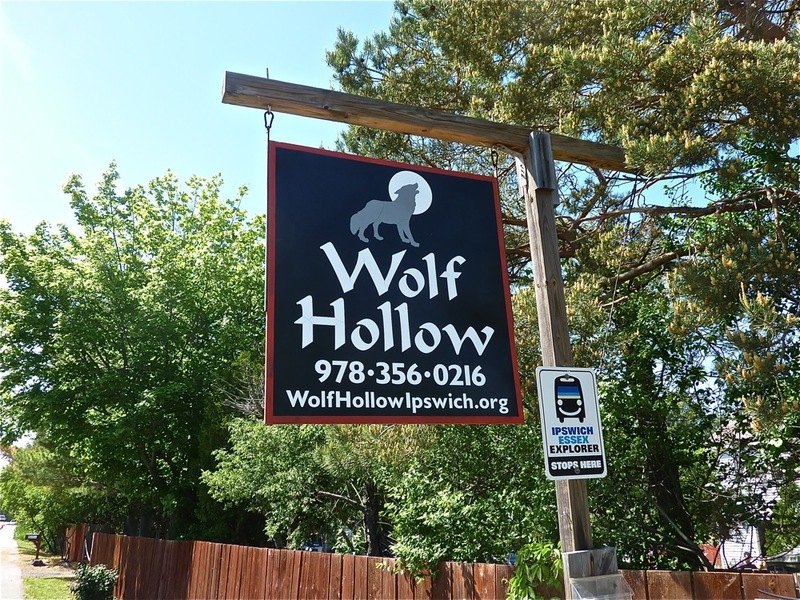 If you are tired of following the pack when experiencing Massachusetts travel, then Wolf Hollow in Ipswich should have you howling with delight at this fascinating North Shore attraction. 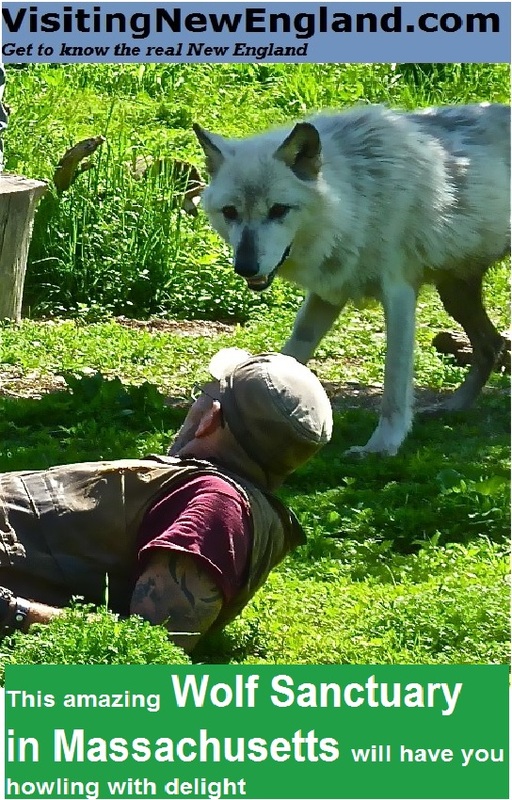 Wolf Hollow offers visitors a chance to view North American seven gray wolves (and one wolf-dog hybrid) in their natural environment through a one-hour educational program. 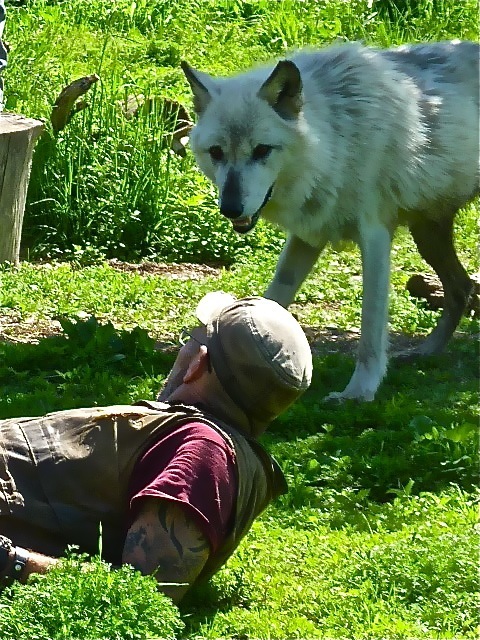 Staff and volunteers provide an educational and entertaining weekend show that raises the awareness of the wolf’s key role in promoting a healthy ecosystem, how packs co-exist, their dynamics, hierarchy and biology, and what can be done to keep the species from dying out. The presentation also reveals man’s historical interaction with wolves. Soffron feels like wolves are like family to him. Most common from the Great Lakes to Washington state, the North American gray wolf remains a threatened species often misunderstood in folklore, religion, and mythology. 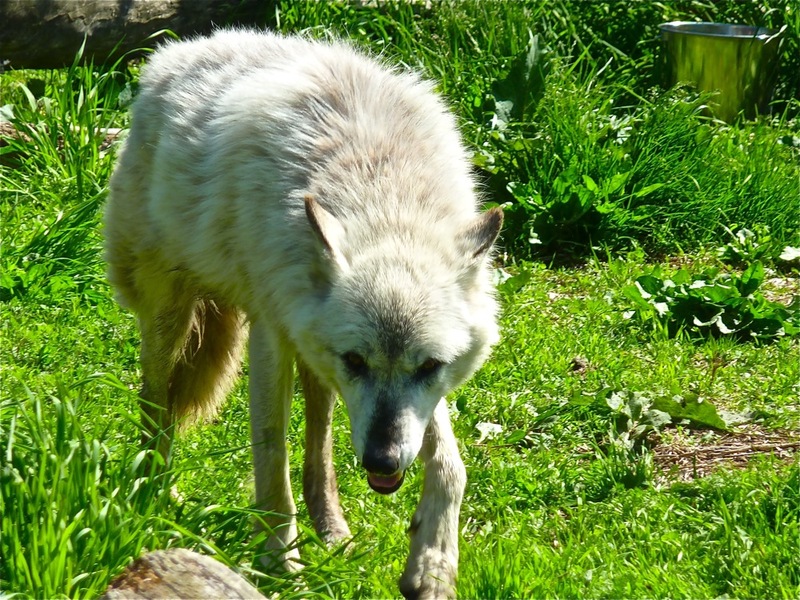 Although potentially dangerous to people like many other large animals, there have been only two reported incidents of wolves killing people over the past 100 years, according to Soffron. They do not kill for sport, but rather for survival as a top predator. North American timber wolf, up and close at Wolf Hollow. Joni Saffron (Zee’s mother) and her late husband Paul started the non-proft North American Wolf Foundation in 1988 and opened Wolf Hollow sanctuary in 1990 with the mission to educate on the importance and preservation of wolves in the wild through education and exposure, as well as to dispel negative stereotypes about the species. Joni determinedly, and passionately, assumed myriad responsibilities as director of Wolf Hollow after Paul died in 2001, to help grow the 100 percent volunteer-operated 501(c)3 non-profit. It’s also a short commute for the Soffrons: They live in a quaint, large home on the land. Zee’s wife, Heidi, works as veterinary technician and assistant treasurer at Wolf Hollow. They have a five-year old son Otto, who, as stated on the Wolf Hollow web site, is a “Wolf Wrangler (in training).” The professional, knowledgeable and energized group employed at Wolf Hollow mirrors, in a work sense, the self-sustainability of the wolves -- that is, by allowing its business to survive through donations, adoptions and proceeds from admission and gift shop sales. 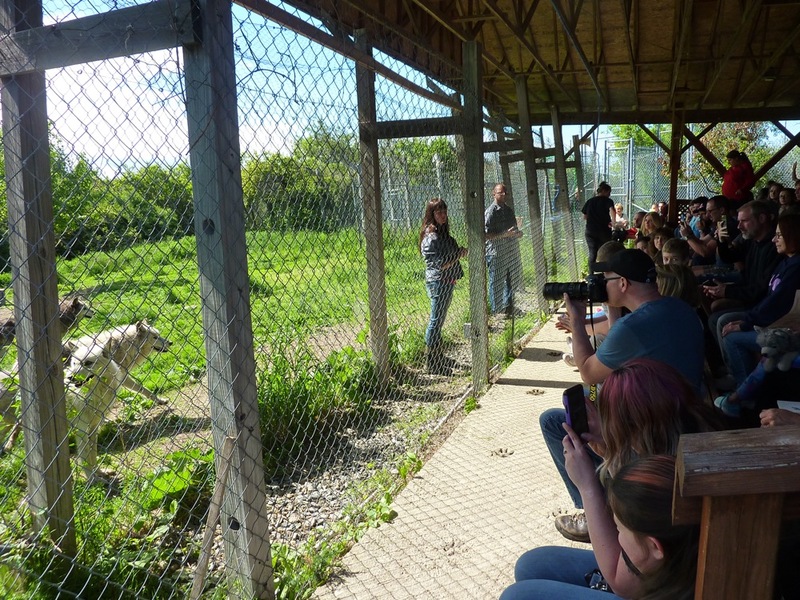 Visitors -- watching from the bleachers near the sturdy tall, chain link fences containing the strikingly beautiful canines -- also get to howl with the wolves at the end of each presentation. 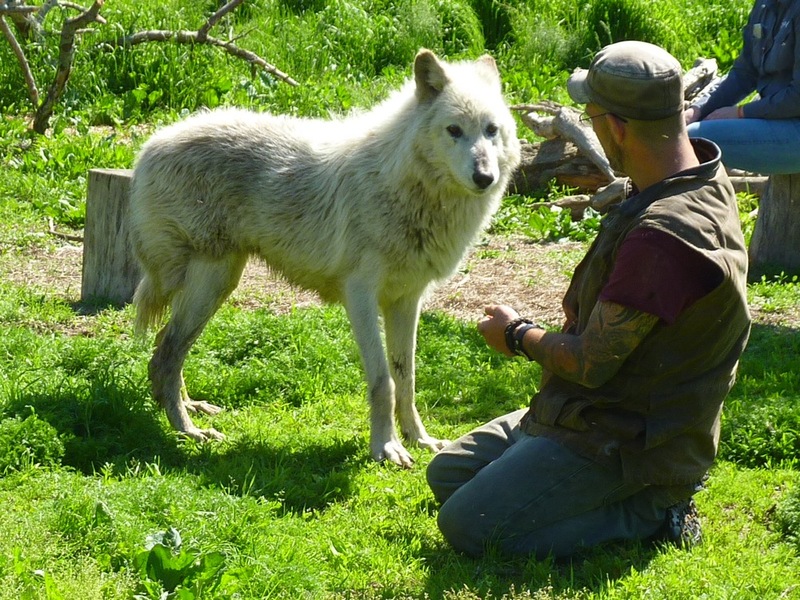 Many guests can be seen leisurely discussing the presentation well after the end of the show and getting last glimpses of the wolves instead of making the typical beeline towards the parking lot. Watching and listening from the bleachers at Wolf Hollow in Ipswich. Apparently, so did approximately 300 other visitors on this Saturday on Memorial Day Weekend with 800 expected for a “Family Day” on Sunday. That’s a far “wolf cry” than the days when Wolf Hollow just started.